A few months ago, I updated the software for this website. This update inadvertently crashed the site’s communications features. I had no idea, but all commenting and private messaging has been offline since January! As soon as I realized we had a problem, I put my tech-savvy husband on the case, and he’s just informed me that communications are back up. If you’ve tried to contact me for any reason in the past four months, please try again! You can use the Contact Me form, or you can leave a comment. You have my sincerest apologies for any inconvenience this may have caused. To make it up to you, I’m offering a special coupon for new students. If you tried to sign up for classes and couldn’t, because of the site’s crash, try again and you’ll get $10 off your first class! 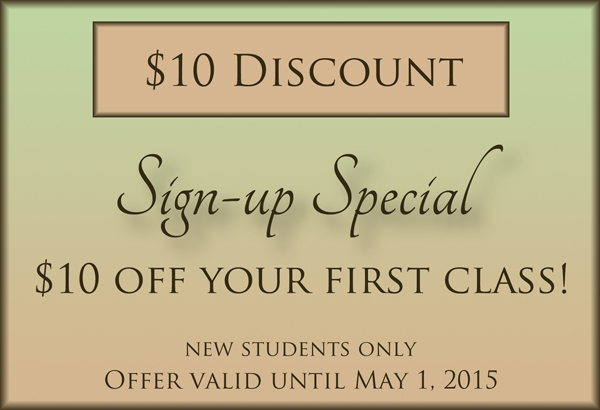 Please print this coupon and present it at your first class to receive the discount. This entry was posted in News and tagged coupons, News. Bookmark the permalink.